Tui Campers - Go where you like, when you like, for as long as you like! Tui Campers is one of New Zealand’s leading rental vehicle companies and is dedicated to providing outstanding customer service for budget minded travellers. We have been in operation since 1983 and specialise in catering to the international tourist market by providing competitive Rental Rates for New Zealand campervan and motorhome hire so our overseas travellers can plan flexible, affordable and comfortable travel with more time to relax and enjoy the huge array of top visitor destinations, attractions and experiences located throughout the North and South Islands. When you Request a Quotation it will be from our late model fleet of superbly maintained and presented campervans and motorhomes, which are also supported by the Automobile Association 24-hour roadside assistance service for your peace of mind. Our Rental Network is unique! If you are going to holiday in New Zealand and Australia you can benefit from our combined Pacific rental network - hire a car, campervan or a motorhome from us in Australia and New Zealand and you will receive our generous Pacific rental rates. 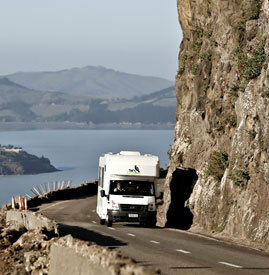 New Zealand is the perfect place for RV exploring and with a Tui camper you can easily Make a Booking and plan your Kiwi holiday to suit your own NZ Itineraries, and with Tui depots based near Auckland and Christchurch airports, we are always close by to help get you ‘on the road’ for your Kiwi experience, so you can go where you like, when you like, for as long as you like - all at your own pace in your Tui motorhome! Along with providing online information regarding our hire Terms & Conditions, you can also view and select from our range of awesome motorhome rental Accessories, including home comforts such as outdoor furniture, BBQ, microwave, high chair, porta cot, solar shower and much more. To make your motorhome rental choice easier, we have included a brief description of each vehicle, however you can click onto any of the motorhomes or campervans you are interested in and view the full specifications, before deciding which suits you best.